We are letting people with disability down. We routinely discriminate against people with disability in the justice system, although we promised to ‘ensure effective justice for persons with disabilities on an equal basis than others’. Ask Marlon Noble how he feels about our compliance with Article 13 – he was locked away for ten years under laws relating to the Mentally Impaired Accused Act, despite never being convicted of a crime. 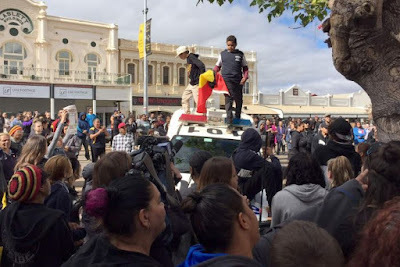 Marlon was ‘freed’ after a campaign for his release, but must now be in a support worker’s ‘line of sight’ for the rest of his life, and must ask permission to leave his home town, Geraldton – something we haven’t imposed on indigenous or other peoples since they were governed and managed under the Flora and Fauna Act in 1967. Ask Marlon how he feels about access to justice. We promised to make sure that people were free from torture or cruel, inhuman or degrading treatment or punishment, but we still routinely employ forced sterilisations upon people who have the capacity to consent when provided with appropriate decision making support. It’s a clear breach of Article 15 and our international obligations to prevent torture at all costs – forced sterilisation constitutes torture. Is that a matter of conjecture or opinion? No. The UN Special Rapporteur on Torture explicitly prohibits it. We told the UN that we’d make sure that people were protected from exploitation, violence and abuse, but there is a clear and acknowledged epidemic of abuse of people with disability in institutional settings. Our response? We’re solving the problems, we say, though National Disability Services, via a program called ‘Zero Tolerance’ - where people with disability are excluded from the process of developing strategies around prevention of neglect and abuse in institutional settings. There is limited national data available, and the national reporting line for abuse and neglect does ‘not cover institutional abuse’ – ring it, and they’ll tell you to complain to the provider. Disability care and support is often tied to housing, so if your complaint is not upheld by your abusers, you’re likely to be out in the street. And they’re the people who are developing the ‘strategies’ to stop it happening – as effective, perhaps, as asking incarcerated paedophiles to develop strategies for child protection. The Government’s response to the issues? The National Disability Strategy doesn’t give us any specific actions around preventing and reducing violence, the National Human Rights Action Plan doesn’t address issues like sterilisation, exploitation, neglect or violence in institutional settings and the National Plan to Reduce Violence against Women and their Children excludes violence against the disabled if they’re in care or service settings. We’re living in poverty, over a quarter of us. We rate lower than Mexico and the lowest of all OECD nations when it comes to poverty risk – 29 out of 29 countries. Our work and employment rates are shameful, with labour participation at record lows and the Australian Public Service leading the way in low participation rates. We’re breaching Article 19, where we promised to let people live independently and be included in the community – we lock people up in a range of institutional settings and don’t give them options about where or how to live. We still use a discriminatory wage assessment tool, the BSWAT, to justify paying people less than a few dollars an hour in sheltered workshop arrangements. As you go through the list, it becomes evident that Australia is doing more than ‘sleepwalking towards the status of a systemic violator’ of human rights – we are galloping towards it. Faster and faster. Despite the National Disability Insurance Scheme and decades of work by disability advocates. The United Nations has the power to launch an inquiry if it receives ‘reliable information’ that violations have been committed by a country signed up to the UN Convention on the Rights of Persons with Disabilities (UNCRPD) and its optional protocol. We don’t want to be locked up any more. Shut in, shut up, shut out. 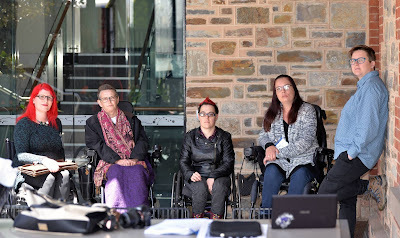 Perhaps it IS time to do what the UK disability movement is doing - stopping the navel gazing and asking the international community to step in.